Find links to more Resilience Scans under Further Resources. A summary of the key points from this publication is provided below. Access to climate information and forecasts is vital for raising awareness of imminent climate risks, but language barriers, technical barriers and lack of knowledge regarding how to apply this information undermines resilience. Greater awareness and comprehension of informal urban contexts are required to reduce misconceptions and to enhance DRR interventions for strengthening resilience in such contexts. Gaps in resilience awareness or knowledge among households and municipal decision-makers across different sectors present a central concern in the academic literature. Market systems development can open up diverse livelihood and market opportunities, thereby enhancing resilience. The involvement of a diverse group of stakeholders in decision-making is necessary to minimise negative impacts and maximise co-benefits in other sectors, particularly in areas of conflicting interests and policies. Though diversification presents a major opportunity to increase the resilience of livelihoods, climate change can also reduce the availability of diversification options. City governments can take action to tackle climate risk and climate change even without significant support from national-level policy, with leadership and creativity. Health systems need to be adjusted to resource-scarce contexts and be able to cope with and learn from shocks for their reorganisation if they are to become more resilient and support UHC in African countries. To ensure post-disaster reconstruction supports longer-term community resilience, standard project management cycles need to be expanded by prevention and preparedness activities. A ‘one UN’ approach that integrates the DRM and conflict agendas is needed to implement the overlapping prevention and sustaining peace agendas. Migrants, particularly those who are not well integrated into society, face greater climate risk as they are less able to access climate forecasts, warnings and other information. Integrating the concept of resilience within the assessment and management of emergency planning can help to strengthen emergency preparedness. To strengthen the resilience of food security, ecological approaches need better integration with socioeconomic considerations, to support a holistic approach across multiple scales. Flexible funding is needed to enable adaptive programming. Emergency cash transfers, and especially cash-for-work programmes, can help to enhance women’s adaptive capacity following a disaster, by supporting their economic empowerment. Strengthening the resilience of smallholders can help them to grapple with climate change, but decidedly reducing hunger also requires structural transformation of food systems. The adaptation of social-ecological systems to continuous conflict can, in turn, shape or intensify the dynamics of the conflict. 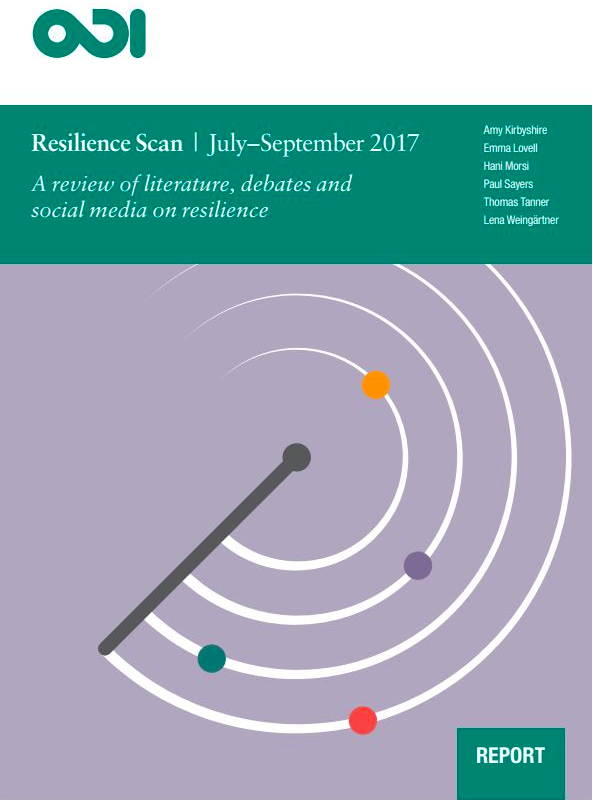 Kirbyshire, A., Lovell, E., Morsi, H., Sayers, P., Tanner, T. and Weingärtner, L. (2017) Resilience Scan July-September 2017: a review of literature, debates and social media on resilience. London: Overseas Development Institute.